The power had been out for over 24 hours, and without my usual electronic distractions I was feeling rather bored and restless. I grabbed my Filsons and my Nikon and headed out the door. Walking through the woods in the snow has always been one of my favorite parts of winter, and fortunately my corner of suburbia is adjacent to a decent stretch of forest. As I made my way through the treeline I noticed there were deer prints everywhere. I followed the tracks as long as I could, taking some iPhone panos along the way. An hour later I spotted about seven of them from a distance. 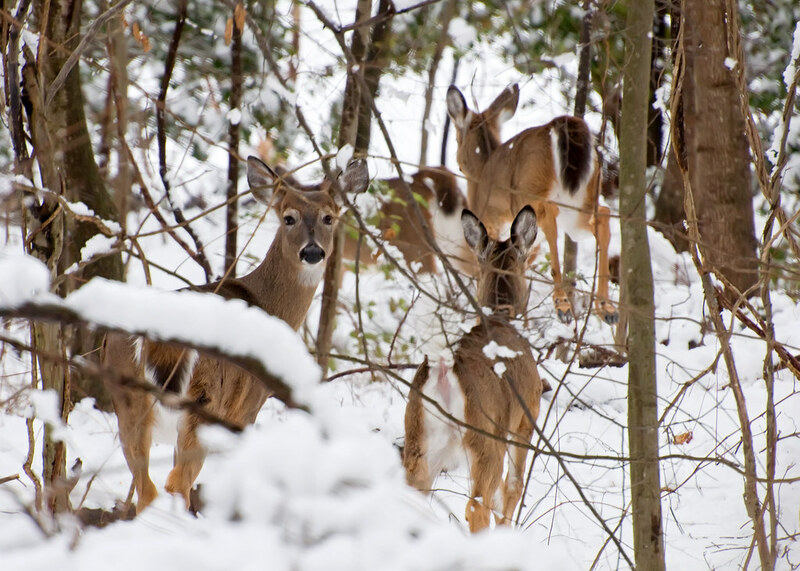 They quickly sprinted off through the trees and it was amazing to see how nimbly and quietly they moved through the snow. It dawned on me that since I was trudging along in heavy boots I had little chance of catching up to them, let alone having them hold still long enough for a photo. However, after another half hour of hiking I somehow managed to stumble onto them once again, and was startled to find them grazing only a stone’s throw away. I froze; they froze; and I just kept thinking don’t mess this up as I slowly brought my camera to bear and started shooting. It was only a few seconds before they all turned tail and bolted. All except for one. This last deer ignored the herd as they bounded away, and turned towards me to observe this new stranger in the forest. I snapped this photo as we stared at each other for a long moment, our mutual curiosity hanging between us. 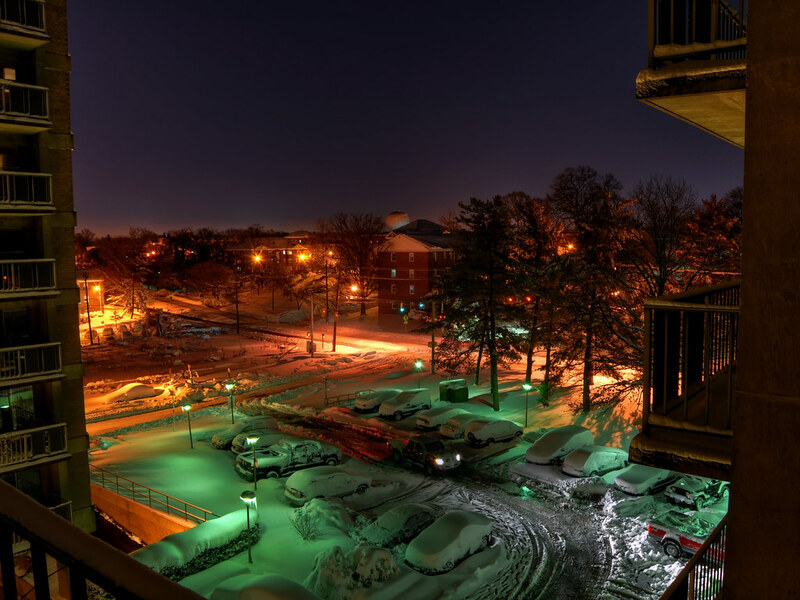 One of the things I used to love about snow when I lived in the suburbs was looking outside at night and seeing the dark landscape illuminated by even the faintest rays of light from the moon. Unfortunately that doesn’t happen much outside our building in Arlington, but the consolation prize is this huge range of color temperatures from the street lamps and headlights. It’s a veritable rainbow of spectral artificiality. While being snowed in during the blizzard I popped my head outside and felt compelled to get a shot of this incredible variety of reflected light; it took longer than I thought and my feet started going numb while waiting for the exposures. After about 20-30 seconds of staring blankly at the Christmas tree I kind of came to and looked around to see if anyone had noticed. Fortunately no one was looking my way at the time, but ever since I started getting focused on photography the same thing has been happening: I go into a bit of a trance after something catches my eye and I’m trying to figure out what it is. What about this scene made me look twice? What drew me in? Should I get my camera out? 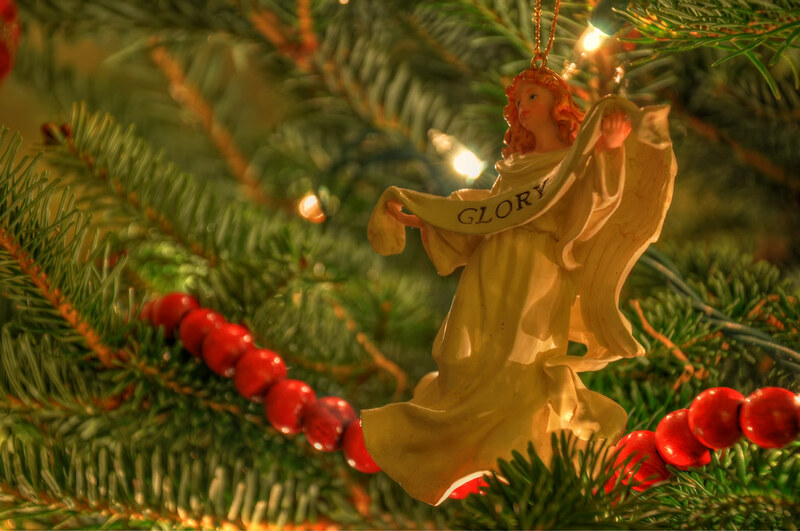 In this case I did, and got this rather triumphal looking close-up of one of the ornaments on our tree. Christmas is one of the few parts of winter that I actually look forward to. It’s my favorite time of year. 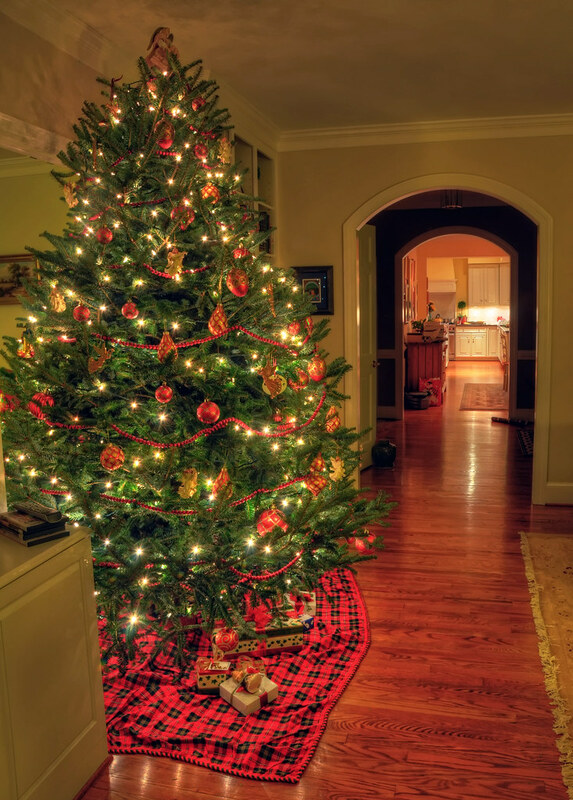 The decorations, the cookies, being with my family, the smell of the tree near a roaring fire, the list goes on and on. I like to think that this picture captures a small part of that spirit. At least it did when I was gazing into the tree and dwelling on it in my mind. On Christmas Eve I stepped outside for a moment and noticed how shockingly quiet it was. There were no birds chirping, no hint of a wind, and the snow on the ground muffled any noise that might have tried to break the silence. It was crisp, cold, completely clear, and quite beautiful. I’m not a big fan of winter in general, but there are moments I like and this was one of them. I brought my camera and tripod out to take some pictures. 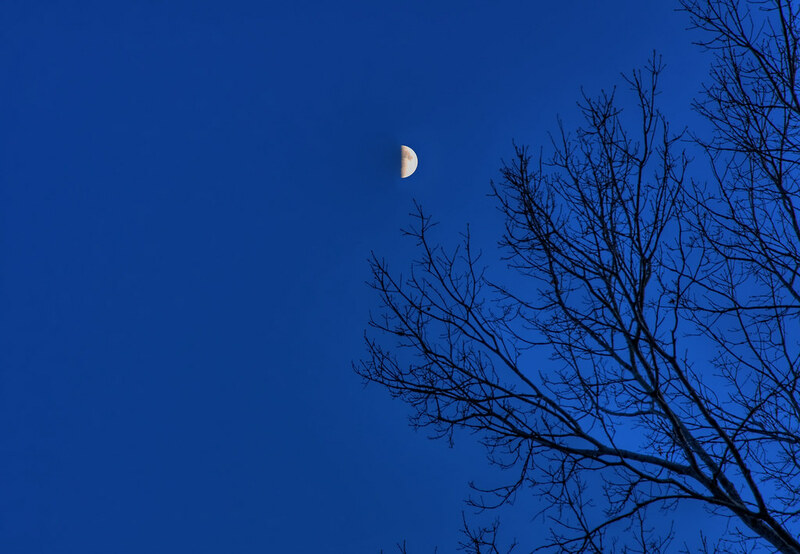 After a few shots I tried to isolate the essential elements of the evening: the deeply blue sky, the bright moon, and the spindly trees reaching skyward. I actually composed this shot specifically for use as a desktop background and never really intended to put it online. But I think it distills out some of the essence of the season, and later in the year when the night is full of sound and movement again it’ll be something to remind us of the austere beauty of winter.